Siding and window installers headache avoided with aluminum half round window trim preformed and sized to fit any window trim. 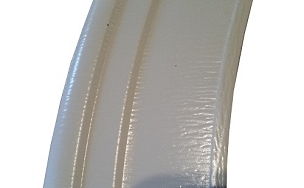 Just choose your measures, color and style to match the trim coil used on the rest of your window trim and this half round aluminum trim will be manufactured to match. Telling a customer “No, you have to paint that one piece of rounded trim,” is not always the easiest way to get paid. And the headache of piecing small pieces of metal around the arched trim can look like an armadillo or lobster tail. These are not great looks. This half round window trim made from the same aluminum you use will look sleek and keep your customer happy. The better the job looks, the better you look. Eliminate the hours of gluing metal together hoping to make the arched trim look good. Order your half round aluminum window trim when you order your windows or siding and the rounded aluminum trim will arrive in about the same time. Just 2 weeks.